I have to do a quick edit. As I feared I missed the deadline over at Tuesday Morning Sketches, even though I didn't get in the challenge I'm going to leave the link below as is so if any of you visiting haven't checked out Melissa's challenge you can hop on over. She's got a great challenge blog going on. I guess I'm all talked out from my last post. This turned out to be a pretty simple, clean line card. Kind of cute. 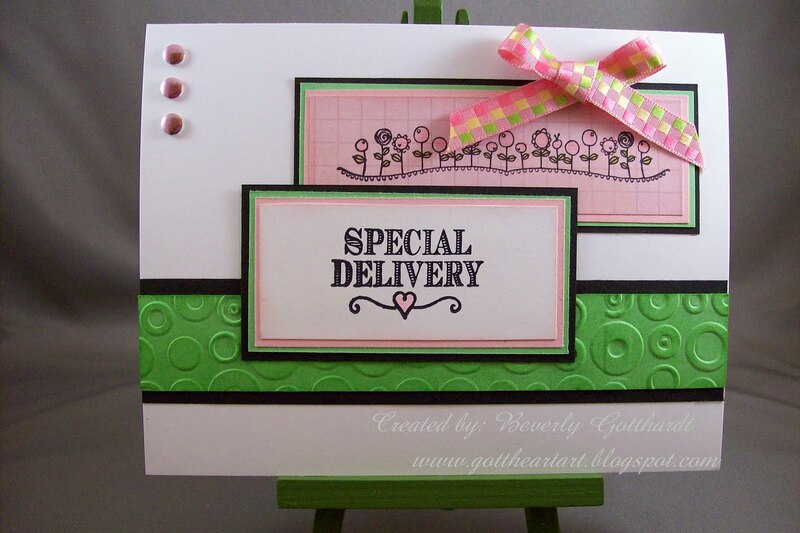 Supplies: White Card Blank 5" X 6 1/2" Halcraft, Papers: Stampin Up, pink graph unknown, Stamp: heidi grace-Baby, Ink: CTMH-Z2102 Baby Pink, Z2113 Clover Meadow, CTMH markers-baby pink, sweet leaf, Cuttlebug embossing folder-Spots & Dots, Offray-ribbon, pink metal dots. So sweet!! I love the fresh colors!! Thanks for joining in the Baby Challenge at Crafty Creations! This is wonderful Beverly - the colors are so happy and I love the embossing. I'm sorry you missed the deadline, but thank you for playing along with us TMS anyway. Thank you for linking your card and sharing it with us. This is super,super cute! Thanks so much for playing along with us at the Color Dare!